Here at Them Digital we specialise in providing Apple Mac support to businesses in central and greater London. We offer a full spectrum of services including Apple Mac support contracts, Mac maintenance, Apple hardware and software sales, Macintosh recovery, networking, upgrades and resolving workflow issues. Whatever your requirements, our friendly engineers are on hand to ensure the smooth running of your studio or office. OSX, the Apple operating system is well known for how easy it is to use. It is designed to appear elegantly simple by disguising some of the more advanced features and carrying them out automatically. An example of this is disk defragging. It carries out this process in the background, meaning that it is one less thing for the Mac owner to worry about and makes the Mac look less complicated to work than a PC. Even Macs have their moments however – and no matter how much we love them, they still need some maintenance from time to time. That's where we come in. Whether your Mac is running slowly, or has a more serious problem, we can provide the assistance needed to restore it to full working order. Whilst it is possible to buy Apple Mac equipment from any high street in the UK, it is knowing what to buy that is key to creating the optimum IT infrastructure. We can help you with that. Our expert engineers can advise on the right solution for your set up and in the process save you time and money. We are resellers for the full range of Apple products including Apple desktops (iMac, Mac Mini and Mac Pro), Apple laptops, Apple monitors, i-Pads and accessories. We can also advise, supply and install a full range of Apple Mac software getting your studio or office up and running in no time. 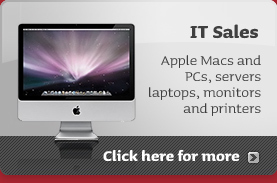 Apple Mac Sales London – click here for more information on our IT purchasing service. Networking is essential in offices with more than one computer if you wish to send and share files between machines. Many people find they encounter problems in this area – particularly when networking Macs with PCs. We can assist you by building a simple secure network that connects all of your machines and devices. Our system overhaul service includes all necessary upgrades and improvements to keep your Mac working at its very best. It includes hardware checks, upgrading of RAM, hard disks and operating systems where appropriate, operating system configuration checks, resolution of software conflicts, analysis of server resources, operating system and application software updates and patches, checking all installed applications for compatibility, full testing of back up facilities and disaster recovery advice. When the unthinkable happens, Them are here to help. If your Mac goes down with precious data on it, we can provide the necessary support whether your Mac is functioning, not functioning or damaged. Our Macintosh recovery service works to recover your data. We will send your hard disk away to one of our partners who recover failed hard disks. This service comes with a free scanning service to see if the data can be retrieved. If it can, data recovery is charged per GB of data with different pricing options depending on how quickly you need it back.